Imagine yourself reclined on a cruise ship, sipping piña coladas, and leisurely moving through the ocean to the next stop along your week-long journey. What could be more idyllic? Now, imagine the thick clouds of smoke, the swarms of tourists and all of the noise that cruise ships bring to port cities. That’s the experience that a group of homeowners in Charleston, South Carolina associate with these gigantic ships docking in their quaint, historic downtown. They don’t want the city to expand its cruise terminal — at least not in the historic district, where some buildings date back to the 1700’s. But the City of Charleston is doing all it can to push back, saying that millions of dollars worth of tourist dollars are at stake. It’s one issue that mirrors some of the complex problems that arise with an expanding cruise line industry. This debate has grown more traction in the wake of Carnival Cruise Lines’ Triumph’s on-board fire caught fire last week. Reporter Kim Severson, at our partner The New York Times, wrote about the growing pushback against the cruiseline industry in coastal cities around the country. “Weary and miserable, sickened by the stench of sewage,” the last of more than 4,200 passengers and crew hobbled off the Carnival “Triumph” Friday, “after tugboats lugged it to the Alabama shore and finally brought an end to a five-day floating nightmare,” “the agony prolonged by a snapped cable connecting the ship to one of four tugboats,” NBC News reported early today. (1) “In the sweltering heat, passengers set up tent cities on outdoor decks, hoping to catch a breeze or simply unwilling to endure the stench emanating from inside.” Other reports tell of tempers flying, overflowing toilets, “squishy carpets,” long lines for food, sickened passengers, children “hysterically crying” and “sewage running down the walls and floors.”(2) “The ship’s afloat, so is the sewage,” said a passenger. The horrific five-day ordeal that began Sunday when a fire erupted on the 13-year-old Carnival “Triumph” cruise ship that knocked out power, leaving it adrift in the Gulf “without propulsion, with little running water, less electricity, and utterly bereft of sanitation.”(3) Passengers alternately endured 90-degree heat and cold rainstorms, many forced out of their cabins as the inoperable toilets and broken air-conditioning systems made the stench and running sewage unbearable. Yet as the crises worsened, Carnival CEO Gerry Cahill merely called conditions on the ship “challenging.”(5) Appearing under-informed, perhaps he needed a thesaurus to adequately describe the catastrophe on-board. Days later, he more profusely apologized. Inopportunely and only days before the “Triumph’s” horror show, South Carolina State Ports CEO Jim Newsome emailed, “Cruise ships, like any of the other ships calling our port, represent maritime commerce activity that is essential to supporting our local maritime community.” Codswallop, Mr. Newsome. Cruise ships aren’t like “any of the other ships,” they aren’t essential, and they represent only a small fraction of port revenues. Cruise ships are sardine cans packed with passengers and crew, susceptible to horrific accidents that instantly can put thousands at risk for their lives. Although everyone has seen the sunken Carnival-owned Costa Concordia that took 33 passenger lives, few know that there have been 79 cruise ship fires since l990. Former Carnival Cruise Lines senior executive Jay Herring admits, “There are so many moving parts and things that can go wrong.”(7) In the case of the Carnival “Triumph,” they did. The NY Daily News wrote that “the interior portions of the 14-story ship have been turned into a sweltering, gut churning sauna far removed from the vision of the boat as ’24 hours of fun a day’ that the company promotes on its website.” One person related: “It’s like a bunch of savages on there.”(8) We’re unlikely to find out all that may have happened. These people getting off the “Triumph” in Mobile are sick, some may be infected with nanoviruses; the crew (given credit by many passengers for their efforts) may be in worse shape; and certainly the ship itself is filthy and contaminated. These cruise ships, owned by foreign owned corporations, are not subject to the rigorous inspections required of ships registered in the US, their crews are also not given the same working condition protections, and, in fact, the Bahamian authorities will lead this accident investigation. “The result is that cruise ships are largely unregulated,” says maritime lawyer James Walker on CNN’s website. (9) Yet the potential for sickness, viruses and disease coming ashore is another important reason that cruise terminals must be isolated–kept apart and isolated for the safety of concentrated, general population areas. It’s not just the taxis, the provisioning trucks, the toxic soot and continuous noise, the parking, pollution and traffic problems, the requirements for ship and food safety, dangerous weapons and border security–the health of our residents is another reason why Charleston’s proposed large-scale cruise terminal must not be built at Union Pier downtown. CHARLESTON, S.C. – Cruise passengers can overwhelm historic cities, causing congestion and chasing off other visitors who mean more to local economies, those attending an international conference on cruise tourism were told Thursday. This year the number of people cruising worldwide is expected to increase. Booking dropped last year after the Costa Concordia capsized off the Italian coast, killing 32 people. The conference is sponsored by the World Monuments Fund, the Preservation Society of Charleston and the National Trust for Historic Preservation. Amos Bien, technical director for the Global Sustainable Tourism Council, said studies of ports in Central America show that cruise passengers mean about $55 a day for the local economy, compared to more than $100 for those who stay in the cities. The industry generated about $19 million for Costa Rica in 1995 while other tourists meant $2.1 billion to the economy, he said. The Thursday discussion ranged from the impact of cruises in Key West, Fla., to Croatia, Norway and Charleston. Ross Klein of Memorial University of Newfoundland in Canada, said the industry in Key West grew from 133,000 passengers in 1990 to 1 million in 2004. In Dubrovnik, Croatia, when several cruise ships dock at a time as many as 10,000 passengers can be trying to enter the walled city of about 42,000, he said. “It’s your city and don’t lose focus in terms of what’s in your best interest,” Klein said. He said there’s little evidence those who visit a city on a cruise later return. This year there’s expected to be 2,300 port calls with 3 million passengers visiting the fjords of western Norway. “When the cruise industry gets too big, it weakens the land-based product,” Christian Jorgensen of Fjord Norway, a tourist promotion board said, adding other tourists may not visit if the fjords become too crowded. Economist Harry Miley last year compiled a report on the Charleston cruise industry suggesting while the city’s historic areas deals with passengers, traffic and congestion, the city gets only a fraction of the surrounding region’s economic benefit from cruises. 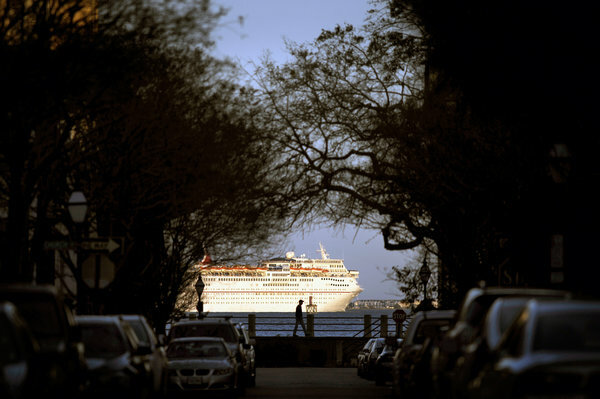 Several lawsuits have been filed over Charleston’s year-round cruises. “The cruise industry needs Charleston a lot more than Charleston needs the cruise industry,” he said. However, another report commissioned by the South Carolina State Ports Authority estimated the impact of cruises at $37 million annually. Carnival Cruise Lines permanently based its 2,056-passenger liner Fantasy here three years ago, creating a year-round cruise industry. Mayor Joseph P. Riley Jr. has said the city has long been a careful steward of tourism and is handling the cruise industry in the same way. The city has a voluntary agreement with the Ports Authority that the city will be consulted if the industry grows beyond its present size of 85 to 100 port calls a year. Opponents of the industry want that a binding legal agreement. The Lowcountry capped a cruise symposium Friday, calling for all sides to open a better dialogue and begin conversations about the impact of the cruise industry on Charleston. The World Monuments Fund, the National Trust for Historic Preservation, the Preservation Society of Charleston, the International Council of Monuments and Sites, the Center for Responsible Travel and the Coastal Conservation League hosted Harboring Tourism: A Symposium on Cruise Ships in Historic Port Communities, which lasted from Wednesday through Friday. Panelists discussed the economic and environmental impacts of the cruise industry, policy tools that can be used to regulate the cruise industry and other topics. On Friday, the group heard recommendations and a recap of the conference. Jamie Sweeting, principal of Sweeting Sustainability Solutions and a consultant for Royal Caribbean Cruises, asked the audience to empathize with different points of view. Sweeting asked attendees to define success for the Lowcountry’s quality of life. “That’s not just for you in this room, but for all of the citizens in this place,” Sweeting said, adding they should represent the many and not the few. Another attendee followed Sweeting and agreed with him, saying dialogue goes both ways and the cruise industry needs to empathize with their perspective as well and make an effort to hear their point of view. A former New Yorker staff writer gave the symposium’s final speech. Tony Hiss has also written 13 books, most recently In Motion: The Experience of Travel. Hiss said the time may have come for new tactics. Hiss said cruise ships bring many contradictions to the surface. Diesel trucks aren’t allowed to idle, but a docked cruise ship can. Cruise ships snarl traffic downtown, but traffic is also stopped every time it rains hard. “Nobody seems to be up in arms about that,” Hiss said. Hiss also advised working collaboratively and reaching out locally and regionally. Those in Charleston who want the city to regulate the cruise industry here say they have been trying to get a constructive dialogue going for three years. But Carnival Cruise Lines doesn’t answer their letters. And neither the city nor the S.C. State Ports Authority appears interested in talking. Still, the key message that emerged during an international conference here on “Harboring Tourism” was: Get a dialogue going. If all the “stakeholders” work together to determine what this community wants to be, and therefore what role it wants cruise tourism to play, the impasse can be overcome. Horror stories about how unregulated cruise operations have damaged historic ports around the world were convincing evidence to attendees at the three-day conference concluding Friday that it is essential for Charleston and other historic ports to avoid falling victim to similar problems. Evan Thompson, director of the Preservation Society of Charleston, which planned the conference in conjunction with the National Trust for Historic Preservation and the World Monuments Fund, said he hopes the conference will be the beginning of a new, constructive conversation about how to manage cruises in this, and other, historic ports. The speakers, who came from as far as Norway, Canada, Alaska and Mexico, shared their experiences. Among them: The once pristine fjords of Norway are crowded with cruise ships and sometimes cloaked in the smog they cause; the ancient city of Venice is dealing with erosion, crowding and visual blight as a result of mammoth cruise ships calling there; and coral reefs near Cozumel, Mexico, are still healthy, but local people fear what might happen since the cruise business has tripled. Several people shared encouraging stories of how a healthy conversation led to mutually agreeable solutions. Sadly, the question of how to strike a “delicate balance” between tourism — cruises in particular — and the quality of life in Charleston turned adversarial almost from the start. Soon after a forum put on by the Historic Charleston Foundation three years ago, in which the city and the port both participated, the question was misrepresented as “jobs versus snobs.” Instead of acknowledging their efforts to find solutions to congestion, traffic, emissions, visual pollution and a possible erosion of property values, citizens were painted as anti-cruise ships (they aren’t) who don’t care about port jobs (they do). While neither the city nor the State Ports Authority accepted the Preservation Society’s invitation to attend the conference, the hosts will make information available. The “opposing” sides are not really so far apart on some concerns. The Ports Authority has said it will limit the number of cruise ship visits to 104 a year, and will limit the size of those ships that call here. Those conditions are acceptable to the other side. They just want an ordinance making the limits binding the way restrictions on other tourist businesses are binding. More divergent are their opinions about where the cruise terminal should be located and whether cruise ships should be required to use shoreside power instead of deisel fuel while docked to reduce harmful emissions. But there is no reason those topics can’t be on the table. The SPA benefits financially from the cruise business, but international port studies have found that the financial benefit to communities is negligible at best, and that the strains that unfettered cruise ships put on ports in some cases negate any benefits altogether. One fear is that cruise passengers in too great numbers will drive away overnight tourists who are likely to spend four times as much while here. And it isn’t just peninsula Charleston that would suffer if tourism suffers. It is a prime economic driver throughout the Lowcountry. If the community is unable to bring other stakeholders to the table, the conversation is likely to go largely to the courts. Already, several lawsuits have been filed in relation to the SPA’s plans to build a new passenger terminal. The Historic Charleston Foundation, frustrated after attempts to work out solutions have fallen on deaf ears, this week threw up its hands and decided to join one of the suits. Fortunately, people in Charleston are trying to address the issue of cruises before there is a crisis situation, and after learning about just how much damage they can bring, when not regulated. It’s a good time for all involved to try to cooperate and come to some reasonable solutions.